Deb Artim has been playing handbells for over 20 years and piano since she was four years old. She works as an instructor in Neuroscience at the University of Pittsburgh. Deb is the elected Ringer Representative to the Board of Directors for Three Rivers Ringers. Bobbie Calhoun lives in South Park and has been involved with music since she was a child. She initially played flute and piccolo, but has focused on handbells for 25+ years. She has degrees in Engineering Physics, Mechanical Engineering and Education, and a minor in Music Education. She has two children and four fantastic grandsons. Carolyn Covelli started ringing handbells at Wilson Presbyterian Church over 20 years ago, and began playing the piano when she was just five. She works in insurance, and enjoys singing, painting, and baking. 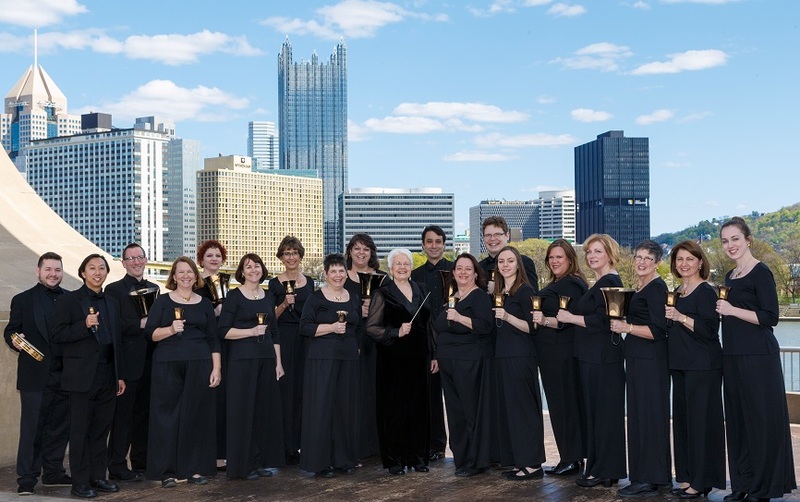 Beth Dakin has been ringing handbells since 1985 in choirs in Virginia, Georgia and Pittsburgh. She has a PhD in Genetics and works as a researcher in the Biology Department at Duquesne University. Beth and her husband have a son and a daughter. Bjorn Dakin joined TRR for the 2015-2016 season after having been a substitute for several years. He has rung in various church bell choirs since 2000 when his wife Beth recruited him. He is a prosecutor in Pittsburgh and lives with Beth and their son and daughter in Allison Park. Samantha Reid DeFurio has been with Three River Ringers since its beginning. She received her Bachelors of Nursing degree from Penn State University and Masters in Nursing degree from University of Pittsburgh. Currently, she enjoys her full-time job of “Mom” to her daughter and son and working as a Health Care Aide in the Mt. Lebanon school district. Cynthia Donahoe lives in Mt. Lebanon and is Clerk of Session at Southminster Presbyterian Church. In addition, she directs the Southminster Handbell Ensemble and is a Stephen Minister. Cynthia is the recording secretary for the board of South Hills Interfaith Movement. She and her husband have three grown daughters. Lisa Falcione started playing handbells while living in the Cleveland area. She plays piano and organ and has been a substitute organist for many years and many churches. She and husband Frank live in Marshall Township and she works for a medical startup company. Dan Fernandez has played handbells for 28 years with ensembles in New Jersey and Pittsburgh, and is a founder and Board member of TRR. Dan is a Carnegie Mellon alumnus and is the Marketing Manager for Subscriptions for the Pittsburgh Symphony Orchestra. He plays clarinet, sings bass, and enjoys hiking. Jeffrey K. Funk has been ringing handbells for over 20 years. He lives in the Penn Hills area and has a PhD in Chemistry from Penn State University. He has worked as the laboratory manager for MAX Environmental for over 10 years, enjoys gardening and has way too many houseplants. Linda Minnotte has been ringing bells since 1971, is a founding member of TRR and its current President. She founded the Mt. Lebanon UMC Chapel Bells and is now an At Large National Board Member of Handbell Musicians of America. She lives in Mt. Lebanon with her husband Rick. Alison Peters learned handbells by joining Southminster Presbyterian’s Handbell Ensemble over 15 years ago. She is a CPA who has her own CPA firm. She has 3 children and is thrilled to be ringing with her son and daughter. Elizabeth Peters was introduced to handbells at Southminster Presbyterian Church. She works as an accountant, and she enjoys composing music and playing the organ. Sherwood Peters began ringing at Southminster Presbyterian Church 15 years ago. He is attending University of Pittsburgh for a graduate degree in Mechanical Engineering and also enjoys playing the violin and ringing Tower Bells. Megan Snider is a busy mom of four boys and uses handbells as her ‘escape.’ She and her husband own their own travel agency, Plum Crazy Adventures. When they aren’t busy here they’re traveling the country. Megan’s been ringing handbells for 20 years.